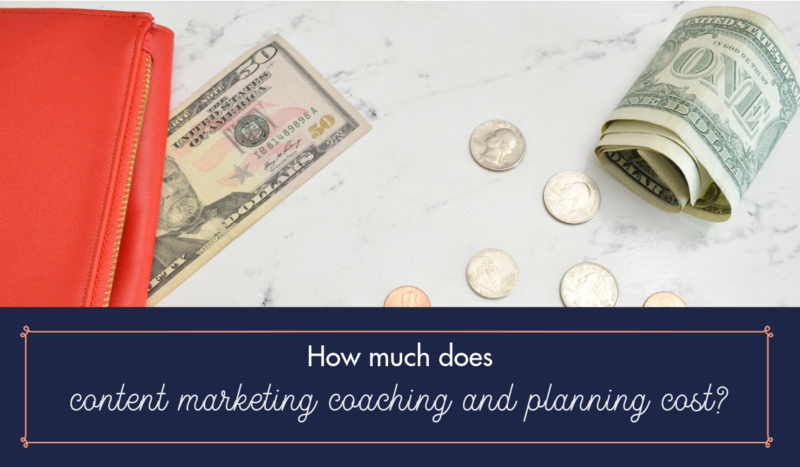 Much the same as in any industry, pricing can vary quite wildly when it comes to business coaching and content marketing support. In fact, amongst other things, pricing was one of the reasons that I pivoted my business away from content production. It’s not that I don’t enjoy writing and designing content; it’s about whether it’s a viable option for the people I want to work with. The truth is, to have someone do all the leg work for you can be pretty costly and given that I prefer to work with smaller businesses, asking them to pay £800-1,200 per month just for blog posts wasn’t always a possibility for them. I also started to notice that a lot of people are completely willing to produce the content themselves, they just weren’t clear on the ‘how’ and ‘what’ aspects of it all. So, I decided to realign my business and with that, I had to reassess the investment I was asking clients to make. People often ask, ‘how much does X service cost?’ The reality is, it costs whatever price someone decides to put on it. It may or may not reflect the value you’re getting but in theory, you can put any price you want on something. Let’s take weddings as an example. At the time of writing this blog, I’m in the process of planning my own wedding. When we looked at venues, the price variation based on days of the week was incredible! As an example, one venue charged £10,000 for Saturdays, £8,000 for Fridays and £2,000 every other day of the week. You got absolutely nothing more on a Saturday than you did on a Tuesday, except your bank balance would be £8,000 lighter. My point is, I can’t give you a firm price guide for how much you should be paying for coaching or any other business support service, because prices can alter based on a whole variety of factors. But I can explain what influences how a lot of people set their prices (including me) and hopefully that will help with your decision making. So, what exactly are you paying for? I studied marketing at university, have been writing professionally since 2003 and spent 4 years as an in-house content writer and editor for a luxury concierge firm, where I produced content that was used by high-end banks such as Coutts, Citi and Amex. I continue to do professional study. I love learning and all of my clients benefit from that because I happily pass all my knowledge on to you. Books, courses, coaching, events and memberships don’t come for free though, so I have to cover the cost of those in my pricing. Any client is of course paying for the time they spend with me and the time I spend working on things outside of any in-person meetings. But that’s not the only time you’re paying for. There’s also the time I have spent in the past and continue to spend, studying to keep my industry knowledge in tip-top condition. I continue to do professional study, and happily and freely pass all my knowledge on to you. How many hours have you lost, staring into oblivion whilst you try to think of content ideas? Or how about the time it takes to nail down a content strategy? Imagine if you spend one day per month planning your content. Now let’s say you work a 7-hour day at £50 per hour, so over the year, that’s £4,200’s worth of time. If I can help you to reduce that time to just two days, I’ve saved you £3,500, so there’s plenty of value in having me give those hours back to you. I’m very open about my prices and display them clearly on my website. I don’t believe in hiding them – I know you have a budget and you know I have a price. Even though I primarily work from home, I have bills to pay, just like you do. I have to cover electricity, gas, water, website SSL certificates, SEO software, website hosting and domain registration, accountant, travel, broadband, insurances etc. More bills – urgh!! There’s rent, car insurance, road tax, healthcare, council tax and house insurance plus the rest of the electricity, gas and water bills that I can’t put against my business. The fun stuff… but it still costs money – holidays, concerts, theatre, yoga classes, birthday and Christmas presents, dinners with friends and family, and, if you’re reading this post pre-July 2020, I’ve got a wedding to pay for too! So, there you have it in a nutshell, a very brief overview of what goes into setting my prices for content coaching, planning and support. I’ve always been very open about my prices and display them clearly on my website. I don’t believe in hiding them – I know you have a budget and you know I have a price, so let’s keep things simple. There will always be people out there charging less or more for similar services but price is NOT the only way make yourself stand out. As a rough comparison though, the highest investment I ask for (as of April 2019) with coaching is £2,995 and for planning it’s £3,995. Both include at least one day in-person and up to 12 months of support. Currently there are others offering packages with 6 months’ support for £6,500 and some with one in-person day and no support for £2,900. Hourly rates I’ve seen vary from £50 to £480, and the cost of having someone write blog posts or website pages for you, ranges drastically from £150 to £800 per post / page. The range of investments I’ve mentioned, only prove that a service costs whatever you are willing to charge and your clients are willing to pay. There’s more to choosing business support than price though – the cheapest doesn’t always mean the worst and the most expensive doesn’t always get you the best. There’s more to choosing business support than price – the cheapest doesn’t mean the worst and the most expensive doesn’t always get you the best. If you’d like to know about some other factors to consider before you commit to working with a coach, I wrote this blog post covering 10 questions to ask when choosing a business coach.